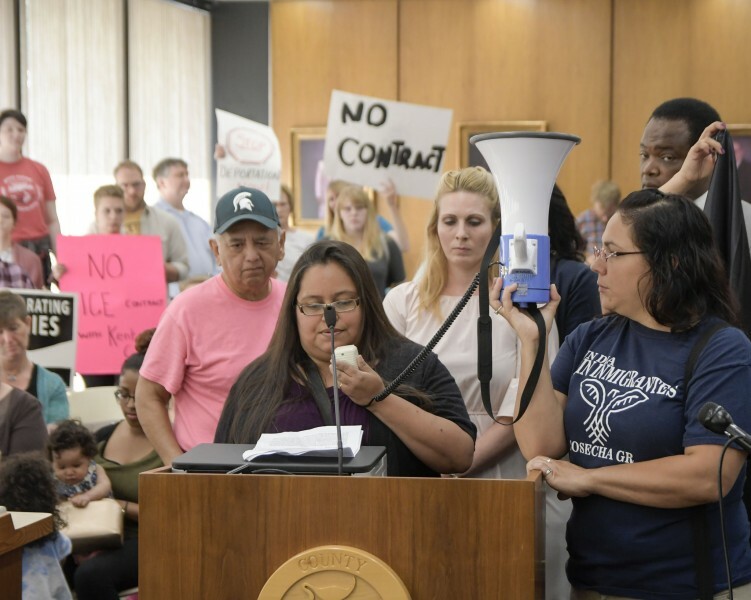 Over 120 people protested outside at Calder Plaza and at the Kent County Board of Commissioners meeting on June 28, 2018 against Kent County's contract with ICE and the detaining of undocumented immigrants. Over 120 people gathered at 8 a.m. at Calder Plaza to call for Kent County to end its contract with Immigrations and Customs Enforcement, or ICE. 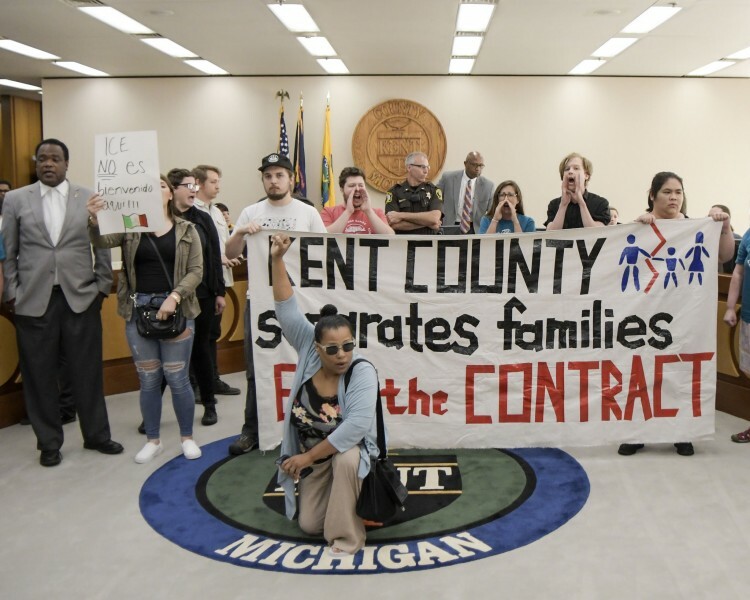 Kent County currently contracts with ICE for $85 a day to detain suspected undocumented immigrants in the Kent County Jail until ICE transports them elsewhere. 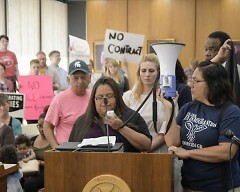 Gema Lowe, lead organizer for Movimiento Cosecha GR, Sergio Cira-Reyes, a volunteer organizer with Cosecha GR and Sarah Doherty with GR Rapid Response to ICE were among those who spoke to the crowd on the purpose of their protest before going into the commission meeting. After an audit report, Board Commissioner Jim Saalfeld instructed the crowd on the rules of public comment and asked if two from the group wanted to speak for 15 minutes each or if each person wanted three minutes. There were several calls led by Lowe of “Let the people speak” from the crowd. Someone from the audience pointed out the board’s website says “with individual comments being limited to five minutes or less." Saalfeld insisted public comments were three minutes only and the comments from the crowd asked him if he was wrong or the website was wrong. The crowd clapped and cheered after his comment and continued to do so for following comments. Protestors chanted “ICE out of Kent County” for a few minutes. During this time, several commissioners got up and left the room. Commissioner Robert Womack walked around the dias and stood with the protestors while Commissioner Jim Talen stood with and then sat with the protestors. The Kent County Commission turned off the microphone during one of the first public comments. They also stopped livestreaming the meeting online. Organizers from Cosecha brought speakers the bullhorn to use as a microphone for the rest of the time. "Your decision today to leave...what if it was your family, what would you do, would you be okay with walking away? Would you still say that it’s okay. You sit in your privilege and you don’t look beyond it. Your job is to serve the people. The least of respectful things you could do is sit here and listen to us. 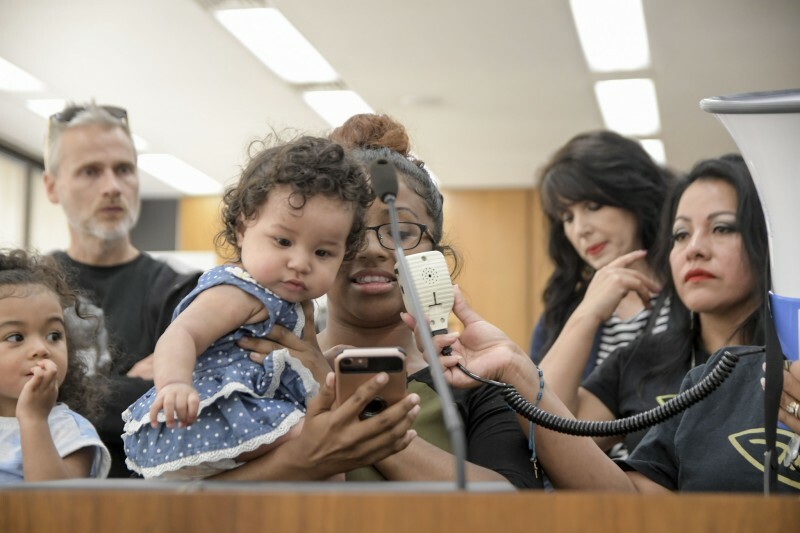 And yet you’re mad we disrupted your meeting for a few minutes and our families are disrupted for a lifetime," said Jackie Hernandez. Eight other people got up to speak about the damaging effects of ICE raids on the immigrant community. Long term trauma to children was repeatedly mentioned, as well as treating all humans with dignity regardless of the paperwork they do or don’t have. Robin Sanchez spoke on the profiling her family has faced and Kent County’s responsibility to all families. 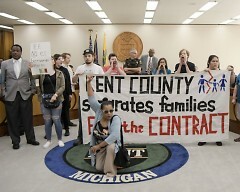 Three more people got up to give a public comment, all in support of Kent County ending its contract with ICE. Commissioners Saalfeld, Ted Vonk, Diane Jones, Mandy Bolter, Stan Stek, Matt Kallman, Emily Brieve were among those who left. In addition to Womack and Talen, Commissioners Betsy Melton, Carol Hennessy, and David Bulkowski stayed to hear further comments. The parts of the meeting not cut off by the Kent County Commission can be viewed on their YouTube here.